Road trips are more fun with your dog in tow. Taking him on vacation with you gives you an opportunity to share new experiences and explore new territory together. For your pet, the unfamiliar sights and scents of strange destinations will stimulate his mind. At the same time, hiking and walking with you will provide him with the exercise he needs. The time you spend together on the road will strengthen the bond you feel toward one another. If you have never taken your canine with you on the road, you’ll need to prepare him for the experience. Otherwise, riding in a car for long periods and being away from home may take a severe toll on him. We’ll offer a few suggestions below. Some dogs love to ride in cars. Others become startled to the point of whining and cowering under the seat. Although the latter response is occasionally due to phobias, it is usually the result of a lack of familiarity with the experience. 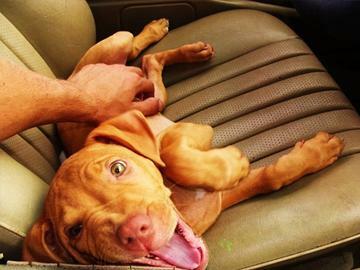 Weeks prior to your road trip, take your canine for short rides in your car. Let him grow accustomed to watching things race by the windows. He can also hear the noise your vehicle makes, and feel the thrum of the engine. If your pet becomes nauseous and vomits, ask his veterinarian to recommend a medication to minimize his car sickness. After several short trips, your dog will become acclimated to riding in the car. A lot of canines are naturally well-suited to spending substantial time away from home. They are comfortable in practically any environment. Other pets become anxious, which might manifest through disorderly behavior, vocalization, and an inability to urinate and defecate. It is important to help your dog adjust to spending time on the road if he has never done so in the past. Take him to unfamiliar places a few weeks before your trip. Let him roam (on-leash) so he will gain confidence that new places are safe. Also, encourage him to eliminate by giving him a special cue (e.g. “go potty!”). Provide a treat and praise to help him form a positive connection. Doing this desensitizes him to the experience of visiting new environments. When you and your canine are on the road, remember to make frequent stops. He will need to eliminate every three or four hours, and maybe more frequently. If he displays signs that he needs to relieve himself, stop the car as soon as possible, and give him the opportunity. Otherwise, a lack of comfort may cause him to form an aversion to riding in the car. Make sure that you keep your dog on a leash whenever he is outside your vehicle. While driving, keep him restrained to prevent him from becoming injured or distracting you. A crate, seat belt, or car seat should suffice. Bring a first-aid kit with you on the trip. If your canine suffers minor cuts and scratches, you can disinfect them and apply a bandage, if necessary. Also, bring his medical records. If, due to illness or injury, he requires emergency care, his records will help the veterinarian tend to him. Taking a road trip with your dog can be a rewarding time for both of you. But make sure you prepare him beforehand to minimize his stress. Scott Jenkins the author of the “Enjoying time on the road with your canine” is a big dog lover. Scott loves to gives his dog treats and his favorite treats to give him are bully sticks. He always buys his bully sticks in bulk to keep expenses low.